A nice video found on YouTube shows Melvin Perez surfing on the Peticodiac River along Riverview and Moncton and what’s keen about the video is that it was shot by one of those radio controlled aircraft that all the kids like to call Drones so it sounds like a Star Wars spaceship instead of a radio-controlled aircraft which sounds so 1970’s. The video was shot by Eric Goggin and it shows the tidal bore coming in and Perez stands up and rides the wave, all shot from the drone above the water. It’s a unique view of the tidal bore and having a surfer in the shot adds some perspective to the speed and size of the wave. The surfer, Perez, is a native of Costa Rica who has been surfing for 15 years. 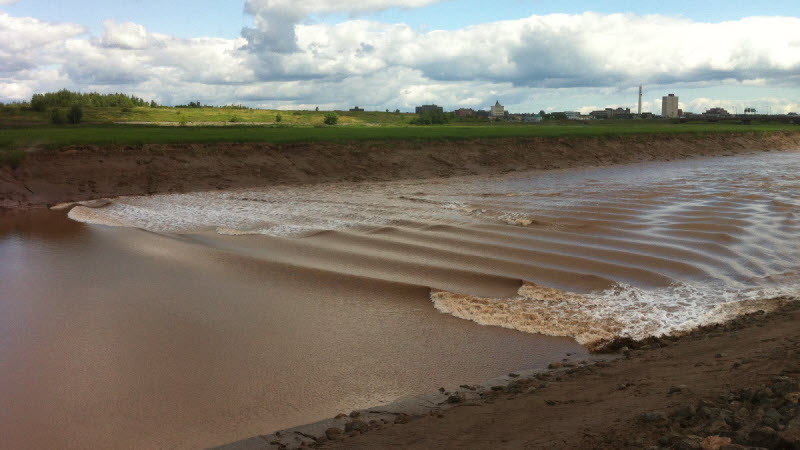 The tidal bore can have tremendous power and only experienced surfers with proper training should venture out onto the cold water and always with spotters and buddies in case of emergency. The last thing we want to see is a bunch of floaters washing up and down with the daily tides!